I love pie. 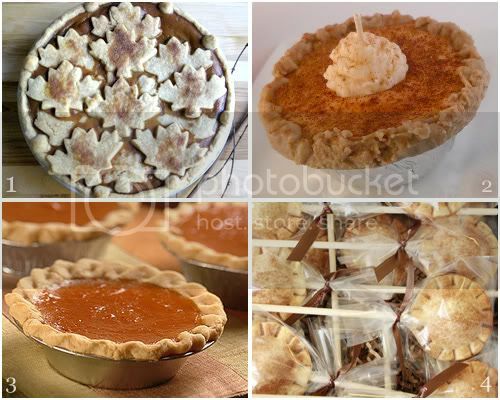 Fruit pie, chocolate pie, chicken pot pie ... you name it. But I am no culinary crackerjack and have yet to bake one. The closest I've attempted is stirring up an Easy as Dirt Chocolate Liqueur Pudding Pie. With Thanksgiving less than a week away, I am especially craving pumpkin desserts. I'm sticking to contributing a creamy corn casserole to the family dinner, but had I browsed the display cases of Etsy sooner, I may have ordered a homemade pumpkin pie instead. All of these baked goodies make my mouth water - and one of them isn't even edible! Wow, these are amazing, especially the candle! I hope you have a wonderful holiday! I love to bake, I wish I could show you how. Have you thought about watching Youtube cooking videos?! Apple! Pumpkin! Minced an' wet bottom. Thanks for your visit today! I stumbled this too :) New follower! Happy to read more of your delicious posts. Have a great weekend! On the other hand I can now blame you if I gain weight...lol. You tempted me beyond reason! Isn't it amazing how creative people can be? All look yummy! Pie is one of my favorite parts of Thanksgiving. All of your picks look delicious!